The Lyric’s production of Die Fledermaus easily outshines every other show so far this season. 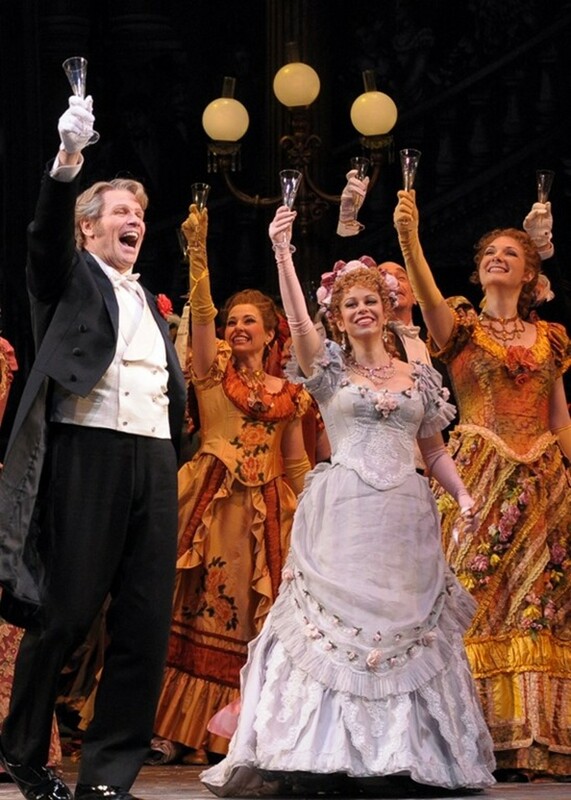 Laughs come quickly and naturally—Strauss’s bourgeois comedy is unforced and buckets of fun. The music is lavish and glamorous, abounding with some of the Waltz King’s greatest tunes. Despite weaknesses in lead casting, a solid supporting cast and a powerhouse coloratura in soprano Daniela Fally served up true Viennese flair. Die Fledermaus is one big champagne-fueled party filled with outrageous characters. While philandering husband Gabriel von Eisenstein (Bo Skovhus) skips jail time for a lavish New Year’s party, respectable housewife Rosalinde (Juliane Banse) entertains her former lover, Alfred (Michael Spyres). Things go awry when their late-night rendezvous is interrupted by prison warden Frank (Andrew Shore). Persuaded by Rosalinde to take her husband’s place, Alfred is arrested and taken away. Unbeknownst to Eisenstein, the party is an elaborate prank orchestrated by his friend Dr. Falke (Adrian Eröd). Rosalinde, Frank, and the Eisensteins’ housemaid Adele (Daniela Fally) are also invited. They assume false identities and thoroughly embarrass Eisenstein in front of the other guests. Pretending to be a masked Hungarian countess, Rosalinde seduces her husband and steals his watch as evidence of infidelity. The final “recognition scene” takes place next morning in Frank’s prison. When Eisenstein shows up to serve his sentence, he finds Alfred in his cell—“I arrested Eisenstein last night,” laughs Frank, “having dinner with his wife.” Thoroughly confounded, Eisenstein nearly comes to blows with Alfred when Dr. Falke shows up, party guests in tow. All is revealed and forgiven—except for Eisenstein’s jail term, which he is compelled to serve. Bo Skovhus plays a surprisingly unlikeable Eisenstein. Skovhus fixates on Eisenstein’s naughtiness so much that there’s not much else left of his character. Skovhus does an awful lot of acting and not enough reacting: His misbehavior feels overdone and quickly becomes tiresome. Eisenstein’s comedy comes from his persistence. He recovers from embarrassment with dignity even as it slips farther and farther away from him. By playing up the oaf, Skovhus loses the gentleman—and delivers a sleazeball performance. Though well characterized, Juliane Banse’s Rosalinde suffers musically. The part requires two timbres—a lighter voice for the housewife and a smoky, exotic one for the Hungarian countess. Her power aria “Klange der Heimat” comes in the second act, when she is called to defend her Hungarian-ness. It’s a sultry, seductive piece with gorgeous vocal fireworks— but Banse’s voice lacks the sexiness and agility to pull it off. Her big coloratura finish feels lethargic and her high notes shrill. Rosalinde does not inspire. Yet Daniela Fally’s Adele is so charming and so brilliant that the leads seem forgettable by comparison. Her voice is cute, silvery, and uncomplicated—the ideal soubrette sound. Fally nails Adele’s famous “Laughing Song” effortlessly, chirping out some of the prettiest trills I’ve ever heard on stage. As a finisher, she throws in a lofty D6 (that’s two octaves above middle C) with surprising ease. Fally’s Adele is the sweet, flirty maid to a tee. She really delivers the character’s honesty and simplicity, serving natural humor without overdoing it. Fally sells Adele’s lesser known aria “Spiel ich die Unschuld vom Lande,” in which she plays stock characters to prove her theatrical skills. Just as her voice cycles through country maid, queen, and Parisian wife one after another, her manners shift accordingly. More impressively (for opera, that is), she convinces us that it’s Adele acting rather than Daniela Fally. As a bonus, she throws in a few splits and Broadway-worthy high kicks. She’s the best Adele I’ve ever seen. The label “immortal” rarely applies to an opera’s plot. Die Fledermaus is a refreshing exception: People get drunk, do stupid things, and blame it on alcohol. It’s like college, but with better vocal performances. The Lyric's Die Fledermaus will be playing through January 18.